Join this wonderful community of neighbors while you can, as there are only 4 new units left, under construction NOW. Very low taxes, minimal maintenance, energy efficiency, great location...just a few of the reasons why you will want to come take a look. 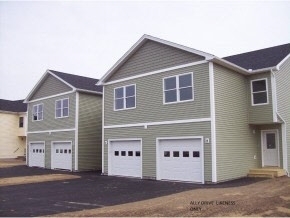 These units are bright & spacious, and include an attached garage, 2 bedrooms plus a bonus room on the second floor for a sleeping room, den, office, or whatever you choose, 2 1/2 baths, and a full basement. Whirlpool appliance package in black or white (as depicted by Seller), to include refrigerator, gas stove, dishwasher, & microhood, or purchaser may choose an appliance allowance of $1,200 for appliances of their choosing plus installation. This is a very affordable purchase for a brand new property, plus you have some features to customize. Don&apos;t miss your chance at one of the last 4 units to be built in this development. PS...a recent purchaser just added a stair-chair to make their unit even easier to access!